Konirna Restaurant in Prague is a mix of modern and traditional Czech, both in cuisine and in appearance. The restaurant is set on a small square in the Lesser Town (Malá Strana), just a few minutes walk from Charles Bridge. The building in which Konirna is based has a tradition of hospitality dating back to 1776. Extensive restoration has refreshed the restaurant and enhanced its charm. Konirna is divided into several distinct parts: the main restaurant, which is modern in design; a traditional pub style restaurant; and a medieval cellar which caters for larger groups and special events. Finally, there is a terrace in front of the restaurant set on a small square, which opens from April to October. The square is hidden from the main tourist route, so it is easy to sit for hours and enjoy the tranquillity and old world atmosphere of this beautiful part of Prague. The menu at Konirna focuses on classic Czech cuisine, but there are some good international dishes too, to ensure most tastes are catered for. Meals include juicy rump steaks, roast duck, wild boar and deer burgers, and an interesting take on goulash - made with smoked sausage and bacon. There are also some delicious large kebabs on skewers for sharing, plus fresh fish from Czech rivers and lakes. There is a selection of Czech and International wines to accompany your meal, along with beers, spirits, and other hot and cold drinks. The food and drinks at Konirna are very reasonably priced, and served by friendly staff who appear to have a genuine passion for their work. 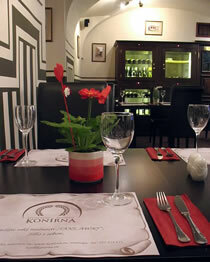 Konirna is a classic Czech restaurant with modern touches, set in a nice location. Because it is slightly off the beaten track (but only one minute off), it offers good value for money and the service is unrushed. If you are looking for a hidden gem, you may just have found it. Konirna feels like a small intimate restaurant because it is split in several parts, but it can actually accommodate fairly large groups. And the restaurant will appeal to all age groups. Advance reservations are essential.